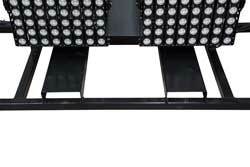 The SMLP-4X500LTL-LED-480V Skid Mount LED Light Plant by Larson Electronics is a massive 2,000-watt lighting system that is suitable for stadium lighting, crane rig lighting, outdoor events and more. 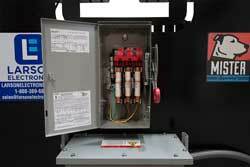 This unit contains 4, 500-watt LED fixtures and operates on 480V AC line-in power. 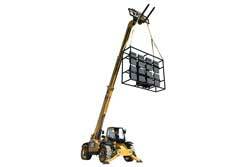 Capable of emitting 135,000 lumens, the light plant is mounted on a carbon steel, cube-style platform with picking eyes for seamless hoisting and transportation. The SMLP-4X500LTL-LED-480V light plant is equipped with 4, 500-watt LED lamps (total of 2,000 watts) for superior lighting in industrial environments. During operation, this unit emits a cool white light at 135,000 lumens in a flood beam configuration for wide area lighting. The light plant runs on 480V AC line-in power and the cable is customer provided for connection to compatible power sources. When in use, the LED light plant can light up between 5-7 acres and reach targets from distances up to 1,000 feet. 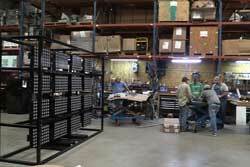 This caged lighting system is designed to illuminate targets from an elevated position. Reflectors around each lamp help focus and amplify illumination during operation. 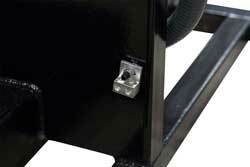 Hooking and securing components around the mount allow operators to raise the unit safely. 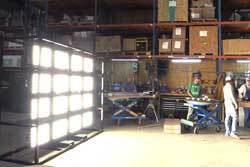 This unit uses 4 GAU-LTL-500W-LED lamps from Larson Electronics, which individually produces 60,000 lumens of high intensity light while drawing only 500 watts. Forty-Eight CREE® high output LEDs producing 1,406 lumens each are arranged in rows and paired with PMMA high purity optics to produce a flood-configured beam. The spot beams are tightly focused and are designed for high elevation mounting to achieve distance. Mounting: Unlike many caged lighting boxes made of plastic and utilizing thin gauge, low grade metals in their construction, the SMLP-4X500LTL-LED-480V is designed for serious use and is ruggedly constructed to withstand demanding conditions and heavy duty industrial applications. The LED lighting system is mounted on a cube-style thick carbon steel mounting platform, resulting in an extremely stable, durable and well protected unit. This model is equipped with picking eyes, which can be used for crane hoisting. 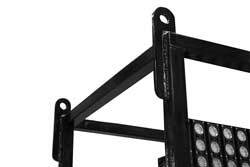 Forklift skid pockets, locking casters and a top located lifting eyelet are also available, allowing easy lifting with forklifts, cable or chain hooks.